We’re proud to share the news that the 2018 Zenyatta Celebration was our most successful year yet! Thanks to our generous community, we raised over $40,000 for Retired Racehorse Project. We’re so grateful for every contribution, big and small, and for the fans who continue to show up year after year. Just wonderful for these very lucky people!! Congratulations!!!! I am happy for you. God bless you Zenyatta, you beautiful Queen YOU! Thanks for the gorgeous picture of our Queen. Love her so. Coz seems so happy and glad he is successful. Bless him. Also glad for such success with the BC Celebration. How grateful they beneficiaries must be. Would be such a joy to hug Zenny’s neck. Hope the winners think of all of us who would love to be there. God bless Zenny and her babies as well as Team Z. Merry Christmas to all. I well remember the loss of the PanAm over Lockerbie. The month before I was in London and surrounds with a friend on my first visit (my only visit so far) to your side of the pond. Great news about Winx!Carry on racing.We are blessed. Continued good health and happy racing to the beautiful Winx! Godspeed, Winx. 29 wins and 8 years old, amazing! Thanks for the news, Sheena. Great team Z, Happy Holidays! Wish you the best, Happy Holidays! Wishing dear Zenyatta team Z and.all who care for our beloved Queen at Lane’s End a very Happy Christmas and a blessed New Year.Also all who post here.Love and hugs. Dear Judy.This is a wonderful story and thanks so much for sharing.Not all horses can be champions but they must be loved and Ricks Natural Star obviously was.RIP.Love and hugs. What an interesting story! Ricks Natural Star was lucky, given his racing history! Bless the vet who rescued him and loved him! RIP, Ricks Natural Star. Love and hugs. What a story and what a wonderful outcome for Rick’s Natural Star. He was quite a handsome horse, and thankfully, a lucky one to have landed in a home where he was so well-loved and happy. RIP sweet boy. As usual, Barbara Livingston’s photos and narrative are outstanding! She never disappoints. Received my Zenyatta DVD today; so happy just before Christmas. Thankfully although the case was cracked the DVD was a-O-K; so I grabbed a glass of Wine, some Brie, a few Breton, and got comfy to thoroughly enjoy the races and highlight moments of her life. This DVD is one I will enjoy forever and cherish all the memories. Thank You Team Z.
Wishing you and Lola Mae a blessed Christmas and New Year.Such a cutie.Love and hugs. Wishing you the very same! This is a wonderful photo of Lola Mae — what an adorable little elf! May God bless us every one, dear friend. She is adorable, thank you same to you! Lola Mae is so adorable. Thank you for sharing her picture! Merry Christmas and Happy New Year. Congratulations to the lucky recipients. I remain always hopeful. To all Z FNs, Merry Christmas and Happy New Year. Peace, love and joy to all. I pad………. fans. So glad to hear about the amt raised for the charity. ThT is awesome. Thinking of my beloved Kauto on Boxing day.He lives on in our hearts…..
Treve will be crossing the Irish Sea to visit Sea the Stars next year.She is in foal to Siyouni.She already has a colt and a filly by Dubawi and Shalaa. Best wishes to all for a happy and peaceful holiday. Merry Christmas to Zenyatta, Zster friends and those at Lane’s End!! May your day be blessed with love and happiness. Zenyatta; Another year not being able to see you but I will always love you just as much as when you were the Queen race horse dancing prior to your races. I look at your recent pic, a most lovely face and even if I did not know you I would love you. Have a wonderful 2019 sweetie. Winx and her devoted carers get into the Festive spirit.Happy Christmas darling. Our boy Hovis is resigned to the fact it’s Kissmus! Merry Christmas to you, Zenyatta! I hope that your BFF Ann will be visiting you soon if she hasn’t already. Merry Christmas to Z17, Ziconic & Coz as well as all creatures everywhere. Merry Christmas to all of the wonderful people who care for our special horses everywhere as well as the special people who contribute to this blog. May God bless all creatures, both two and four-legged. Beautiful! Merry Christmas Zenyatta, Charles and all of Lane’s End! Thanks for posting this, Sheena. Happy Christmas to you, dear friend! Congrats to all! Our Queen looks stunning as usual. Congratulations to all the winners. 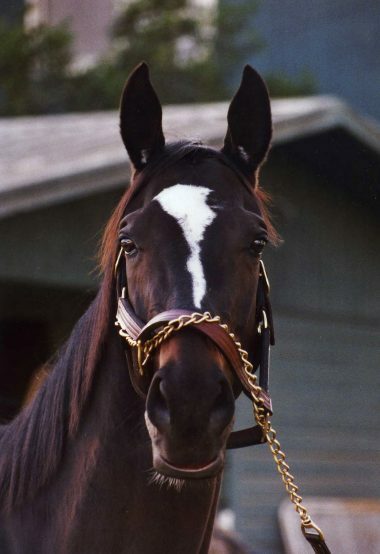 What a beautiful photo of Zenyatta. She looks so alert, which is good to see.